A report about the use of Sacred Scripture may not be missing at a seminar for leaders of prayer groups and pilgrimages to Medjugorje. People who wish to orient themselves on the life of the messages of Medjugorje repeatedly ask questions about this theme. The most common question surfaces from the recognition that neither is anything new being said about faith nor are there any comments offered in the messages about present occurrences. Often the visionaries referred questions that had been given to them to pass on to Our Lady to the fact that all answers are to found in Sacred Scripture. So, why then the messages from Our Lady if, after all, everything is to be found in Scripture anyway? To this one must primarily state that the reading of Sacred Scripture is so very clearly requested in the messages, and in so doing also to what God is trying to show us through the revelation of the word in Sacred Scripture. Sacred Scripture is the 'document of our faith' in the double meaning of the word. It tells us what God says about Himself and what He passed on or revealed to us; and, moreover, that it is our binding document in which all of this is written down. So the Bible tells us in praise and in gratitude about God's great deeds and His eternal Lordship. It is, however, also a guide on our path to holiness so as to be increasingly in union with Him and with each other as God's people. It is important that prayer groups that have sprung up everywhere and who together all read Scripture, also have experienced company. Every theological introduction into the Bible is based on the fact that Sacred Scripture is God's word in human language -- language that was recorded a long time ago in a foreign cultural surrounding. To understand it correctly, it therefore needs an understanding of the contexts, of the manners of speech and of the circumstances of those times. But the biblical text must also be recognized as the word of God for our own times. Then it must be put into action; and only then can it come to a correct interpretation of it. Without taking these into consideration, the danger occurs that one can get all entwined in fundamental mistakes. But because the most important assignment for studying Sacred Scripture is to deepen our faith, we are always strongly advised to combine the reading of Sacred Scripture with prayer. The Bible is a help to our prayer and a series of signposts for our path in life, and not a reading book. In 'Medjugorje Prayer Groups' one always prays for the assistance of the Holy Spirit before it comes to reading a part of Sacred Scripture. For the times after He left, Jesus promised: "And I will ask the Father, and he will give you another advocate to be with you always. The Spirit of Truth..." (John 14:16) will teach us and remind us of everything. (John 14:26) Here with Our Lady's invitations it concerns the same thing -- that we pray for the Holy Spirit, so that we can understand everything. Especially before Pentecost, she repeatedly invited us to pray for the pouring out of the Holy Spirit, to ask for the Spirits of Prayer and of the Truth. Being open toward the Holy Spirit means being enlightened by Him, and thereby also enables us to witness to Mary's presence in Medjugorje. Relative to our experience, particular problems arise in the reading of the Old Testament. Here it is especially important to remind ourselves that many Old Testament books came about while being subjected to a lengthy process of tradition. God revealed Himself to the Patriarchs and Prophets while these then passed along what was revealed to them in a verbal or written manner. The teachers of God's people thought and prayed through the transmitted word of God and also explained it further until, much later, all that had been traditionalised in this manner was finally recorded for all time. What is important for us is that we realize that these writings themselves have been recognized by Jesus Himself, as well as by the Early Church, as Sacred Scripture and were then passed on to the Church as such. The Old Testament pointed toward Jesus and prepared for His Coming. Some parts of the Old Testament are only explainable through the understanding of those times. About some things Jesus said: "To the old ones, it had been said ... but I say to you..." Only with the New Testament does God's Revelation then find an explanation for things revealed already earlier, and then for its completion. Yet in particular it will often become necessary to inquire at competent sources when one gets no further in understanding more difficult parts of Scripture. Useful is the continued reading of Scripture, which then makes the contexts more clear. Such constant reading is, of course, a possibility, but should not be understood as a fixed order. Particular stimuli or times of Feasts require particular texts that refer to them. For Priests and Religious who in their Breviary have a scriptural text anyway, it is not suggested to find another follow-up text to it, but for further understanding of it, it is rather much more supportive to read the expected text in meditation or in finding further commentaries upon it. Also, may this advice especially refer to the Liturgy of the Holy Mass. The celebration the Mass should after all be the height and the source of strength of our faith, and in any case this is what the teaching of the Council, ABOUT THE LITURGY, requests of us. In the Mass, not only does Salvation become present for us, but here we are also gathered around Christ and hear His word and the instructions that He gives us. Then back at home that day's Scripture can be reread, can be thought through slowly and again, if there was one, be connected with the sermon of that day. In just the same way, a preparation by finding out the readings for the day in advance can also be valuable for Mass. Then as a summary for all inspirations, one can then look at the call in the message of August 25, 1993: "Read Sacred Scripture, live it, and pray to understand the signs of the times." The comment of some Priests who say that the messages supply an important source for the preparation of their sermons also fits in this context. Just as they are, the messages themselves are already like sermons through which the revelations that are already written in the Bible can again be worked upon. Among them one finds formulations that push one to passing them on. A use of the messages for preparation for sermons is also justified because they are to be found in context to the very centre of the Gospel. The Pastoral Theologian, Univ. Prof. Paul Zulehner said: "That Medjugorje leads toward the Bible, rather than away from it, is for me one of the foremost theological criteria that Mary is not the destination, but rather only the signpost." It is always good to hold onto the word of God in simple manner, to think about it and to let it work upon us in prayer. The Mother of God herself can be our model in doing this. Twice do we read in the Gospel of Luke that she thought about Jesus' words and the activities around Him, and that she then weighed and treasured what all this was to signify. In this way, the word of God should enter into the hearts of people, there then to bare fruits. When one takes the Bible into ones' hands to read Sacred Scripture, then it is no longer a normal book, but rather contains a special message that God in a very personal way wants to address to its reader or to its listeners. The best way to listen to the message is as though one is hearing it for the first time, for it is in this manner that one can grasp the meaning of the words most clearly. Whoever gives any biblical text such attention, seeks in it the hidden truth for himself and recognizes that for doing so the Light of the Holy Spirit is also necessary. In this way the reading by itself then combines itself with prayer, and the heart turns itself always more intensely toward God. This gift, this 'conversion of the heart' is spoken about from the very beginning of the messages in Medjugorje. Whoever reads the Sacred Scripture in this manner will experience a deep yearning, not only to always come to know the word of God more deeply, but also to always fulfil what it specifically expects of him. In doing this, the reading of Scripture becomes not only a time dedicated to prayer, but that also takes effect in a deed, in an activity that is in accordance with God by being entirely inspired by the biblical words. Whoever, due to the messages of Medjugorje, reads the Bible will, similarly as this author, in doing so discover the parallels in the content. As an example, let us here refer to some relevant texts and, to begin with, the similarity of tone at its beginning. "Believe in the Gospel" and "the kingdom of God is at hand" can be read at the beginning of the Gospel of Jesus Christ. (Mark 1:1, 15) The call to faith and the awareness of the proximity of God's Kingdom becomes a renewed reality in Medjugorje. Here too it all began with a call to conversion. Here too the proximity of God's Kingdom can be experienced and, from here on forward, it unfolds anew and is not to be missed! As an assignment from God, John the Baptist called for conversion (Mark 1:15) and the story of Medjugorje began on the Feast of the Baptist. The call to conversion is the foundation of the messages that are from there directed to the people. As did Jesus recommend prayer and fasting as being the steps to conversion to those who surrounded Him, (ref. Matt 5:5-18 & Mark 9:29), so also are they emphasized in Medjugorje as the fundamental steps. In both the Gospel as well as in Medjugorje, it is said that we may never turn away from prayer, because it is in prayer that we are turned toward God. Fasting too is called unavoidable by both and this because it frees us of all the chains to what is transitory, and, in so doing, frees us for God and His requests of us. 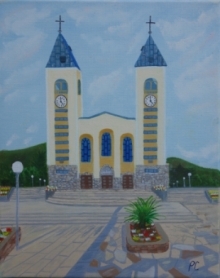 Of greatest significance in both the biblical revelations as well as in the messages of Medjugorje is that peace is a gift from God, but also the result of human endeavour. Peace is offered to man as an assignment and the Gospel praises the peacemaker as being blessed. (Matt 5:9) But at the same time, and unavoidably so, the Bible also says: "May the Lord bless his people with peace", prays the Psalmist (Ps 29:11), and the benediction of St. Paul is: "May the Lord of Peace himself give you peace..." (2 Thess 3:16) The messages of Medjugorje emphasize exactly the same things -- the relevance of ones own working for peace and the necessity of praying to God for it. This neither means an addendum to nor a change from the revelations, but rather proves itself as an urgent call for us to put into reality in life what God has already told us in Sacred Scripture. The special quality of the messages of Medjugorje lies in the fact that they are being said by the Mother to "her dear children". As Mother of Christianity and Mother of the Church, Mary brings us the Gospel of her Son with all love, yet also emphatically, back into our memories. Sr. Emmanuel of the Community of the Béatitudes pointed us to a very real meaning of the messages of Medjugorje as related to Sacred Scripture. On a regular basis, she sends news of Medjugorje to the Abbaye Blanche and which from there are then spread throughout the world. On January 15, 1994, it said in her news: "We are being flooded by a deluge of prophecies -- a confused, fearful and contradictory deluge. We thank the Gospa that she has again led us to the spring of the true light, which is the living revelation of the Bible." Vicka once reported that Our Lady said: "Take the Bible into your hands every day in the morning, and read a few lines and then live those lines throughout the day. In this way, you will find the answer to what that day brings you." This does not mean that we should expect that the answers to all our questions will appear as lightning, but whoever reads Sacred Scripture regularly will be more and more penetrated by the Spirit of God -- the Spirit who after all speaks to us in it -- and thereby will be able to find the answers to all questions about life. The incorrect opinion that one will immediately receive in it all answers to all problems in life must be turned away. The messages of Medjugorje are a pressing call for us to live the Gospel. This has already been shown in the call to conversion, both the starting-point of the Gospel as well as Our Lady's messages. Here are a few more important testimonies when the Good News is compared with the messages of Medjugorje. The surprising fact that Our Lady is appearing in Medjugorje for such a long time explains itself with the following advice: "I desire to teach you how to pray." (June 12, 1986) The goal of this instruction is perpetual prayer, and we are repeatedly led to it. Perpetual prayer becomes reality when someone in everything he thinks, speaks and does never again leaves God out of his view, and is at all times lovingly aware of His presence. Such a steady devotion to God in no way blocks the good fulfilment of life's assignments. On the contrary! Whoever always has God in front of him, also always remains aware in all his doing and allowing of his responsibility toward Him. He never loses hope in God's company and support because he knows that God is also here for him. This 'being in perpetual prayer' does, however, demand specific times of prayer in which one repeatedly turns to Him exclusively and with all one's being. "I beseech you, dear children, come to prayer with awareness." (November 28, 1985) and "You, dear children, are not able to understand how great the value if prayer is as long as you yourselves do not say: 'Now is the time for prayer! Now nothing else is important to me, now no-one but God is important to me.'" (October 2, 1986), are the ways that Our lady invites us to prayer. In a particular sense, a regular schedule of prayer is also perpetual prayer in that it is repeatedly picked up upon and, in such a way, never ends. In this sense also Our Lady calls upon us to begin the day with prayer and to end it with prayer. Certainly such a habit will lead, if it is real prayer and a prayer of the heart, to prayer taking the first place in our lives. Our Lady invites not only each individual to do this, but also families. She wishes to lead us toward our day being "only prayer and a complete surrender to God." (September 4, 1986) Prayer is mentioned in the Thursday as well as monthly messages more than any other subject. As a dedication in a book, Marija once wrote that Our Lady wishes for us to pray every day, and she then added: "Through prayer you can achieve everything, including that which you consider to be impossible." This is the same as Jesus said: "If you remain in me and my words remain in you, ask for whatever you may and it will be done for you." (John 15:7) Our Lady began her instruction in prayer to the visionaries in proposing certain prayers, as did Jesus respond to the disciples request that He teach them to pray by reciting to them the Our Father. (Luke 11:2) The strongest request of Our Lady, when it comes to prayer, is to pray with the heart. "Dear Children, Today I call you to prayer with the heart..." (May 2, 1985) When asked, the visionaries emphasize how decisive it is to pray with the heart. On this subject Marija said: "Our Lady leads us to pray with the heart. The heart must be present with what the words say." and at another opportunity: "Everything that worries one, one must present and recommend trustingly to become free of it, so that one can pray with an unburdened heart." Under the direction of Our Lady, the visionaries learned anew what is already written in the letter to the Philippians. "Have no anxiety at all but in everything, by prayer and petition, with thanksgiving, make your requests known to the Lord." (Phil 4:6) The prayer of the heart does not merely show supernatural results, but it also takes beneficial effect in the natural realm. It assists in overcoming exhaustion and gives one joy and rest. The loving 'giving of the heart' -- meaning the entire human personality -- is what is decisive in prayer, no matter whether it is in the efforts of beginning or in the goal of perpetual prayer. "To pray with the heart, that is what is most important." (Marija) and "that is true prayer." (Ivan) These are the testimonies of two young people who Mary directed toward real prayer. As Jesus with three of His Apostles was on the mountain of the Transfiguration, the other disciples, in meeting a possessed man, experienced the incredible strength of the evil one. Only once Jesus had returned and threatened the demon did he let go of this regrettable man. Jesus taught the astonished disciples that such a thing can only be achieved through prayer and fasting. (Matt 17:14-21) When the significance of visions and their conveyed messages is not to be found in their supplying us with anything new, still now and again forgotten truths can in a renewed manner be brought back to our memories. Was the fact that fasting is the most powerful weapon against evil not nearly forgotten in Christianity? Jesus dedicates a lengthy explanation to fasting on the Sermon of the Mount. (Matt 6:16-18) He Himself fasted (Matt 4:2) and justifies fasting at the suitable time. (Matt 9:15) The call to fasting has found its place in the message of Medjugorje from the very beginning. The visionaries passed along this call soon after the beginning of the apparitions, and in the Thursday messages, it is mentioned repeatedly. There Our Lady addresses our inner most readiness to do so, and again "...with the heart" is also called for with fasting. (September 20, 1984) She motivates us with the pointer that our fasting is a contribution in overcoming evil and also gives us an amount -- quite noticeable, yet for the healthy person also quite manageable -- of twice a week. The call to fasting in the message of Medjugorje is an invitation, not a commandment. It is the invitation of a loving mother toward her children to whom she entrusts great things, but in whom herself, after all, it also concerns great things. Already in the year 1982 all six visionaries conveyed the message that through prayer and fasting even wars could be averted. For this reason already under the old Covenant the prophets in times of crisis called for prayer and fasting. We honour Mary as the Queen of Prophets and her invitation comes during a time that is defined by catastrophes and dangers. We must be grateful that through her we are made aware of comparisons that we by ourselves would never have recognized. It is also important that the call to fasting is always combined with the call to prayer. First prayer, in being concentrated upon God, gives fasting its value and its effect. Willing fasting takes effect in many varied and beneficial ways. It frees us from being dependent and being bound, and thereby makes us free for what God wishes to give us. Also, many cases of brotherly love first only become possible due to renunciation. Whoever fasts thereby contributes to peace, to healing and to the victory of goodness. Nearly in every message of Medjugorje Our Lady thanks those who obey her call. Sometimes she also thanks specifically for other things, such as for the readiness to consecrate oneself to her, for prayers, for efforts, for sacrifices or for turning the messages into one's life. She thanks all who do something for her. "I wish to thank you for every response to the messages." (January 8, 1987) How much this always newly expressed thanks includes, will become ever more recognized depending on how clearly someone will recognize this "thank you" as being a personal one. Once a young person, impressed with uninterrupted stream of pilgrims that she is exposed to, asked the visionary Marija Pavlovic how she could even withstand such a burden. Marija responded: "If you only knew what it is like to be thanked by Our Lady!" Among us, it should be different. Our Lady calls upon us to thank incessantly. External signs or words of gratitude are good, yet fasting and other good deeds are also appropriate for this. Decisive in this is our loving behaviour and our esteem toward the One who is doing the giving. We can only speak about freedom in inaccessible, human ways. The cooperation between God's Almightiness and human freedom will always remain an impenetrable secret. Because no one can be forced to loving devotion, the freedom that God gives us is the supposition that we answer His love with our love. Freedom, however, also includes the risk of refusal. During an address on his pastoral visit to Vienna, Pope John-Paul II concluded that "the history of mankind is the history of abused freedom." Medjugorje teaches us to take time for Holy Mass and this includes preparation before it, as well as reflection after it. Because they are no longer able to truly concelebrate Mass, many have even stopped using a Missal. Then they say: "Mass gives me nothing." Through Medjugorje, many have again come to understand it. Holy Mass is a time given to us during which Jesus gives us graces. Therefore, we should love to come to Mass, accept it with love and to partake in it more actively. To a pilgrim's objection that he had no time for Holy Mass, Marija once responded that it depends upon what values one organizes ones day. Where "holiness" is exclusively united with the 'elevation to the honour of the altars', the call to holiness must stay unintelligible. As Sacred Scripture does, so does Our Lady mean "holiness" as every union that we while living can have with God. This was founded in our Baptism and throughout life we should, with God's help, unfold it more and more until it finally finds its completion in Heaven. Through Mary, the Son of God wished to enter into our world and through Mary we are held to do what he tells us! (Cf. John 2:5) This is Mary's permanent mission and assignment. Theologians have diverted Mary's teaching as being the model for the Church. The Church too should bring Jesus close to the people and teach them to fulfill His word. Thereby every person in the Church has an assignment to find Jesus - for himself to live according to His word and then to lead others to Him. And here Medjugorje, through Mary, gives us new hope when she says: "I am your mother and I invite you to come closer to God through prayer, because only He is your peace, your Saviour." (September 25, 1993) Once a Priest from Medjugorje summarized Mary's meaning for us, as taken from the experiences of young visionaries, by saying that they experience Our Lady as mother who wishes to embrace the whole world. The Mother of God does not come to Medjugorje to remove the cross. She is a realistic mother who does not convey illusions to her children. She knows of the need for the cross and for suffering, and invites that one accepts the cross of life with love. Jesus carries the Cross out of love for us, while we, out of love, should follow Him with our cross. On Good Friday, April 5, 1985, Our Lady said: "You parishioners have a great and heavy cross to carry, but do not be afraid to carry it. My Son is here who will help you." Mary invites us to pray as often as possible before the cross, to reflect there upon Jesus' suffering and then promises that great graces come from there. In whatever distress, the cross in this way will become a joy; of course, not to be understood as a mood or a feeling but rather as a deeply experienced Creed. Kurt Knotzinger - was born in 1928 in Vienna. After completing twelve years of studies in the field of Music and Theology, he began his work as Parish Priest. However, from 1966 onwards he took over as Spiritual Director and Professor in the seminary as well as the high school of the town of Sachsenbrun in the Viennese archdiocese.